I like to get acquainted with as many RCA members as I can, on my way to meeting all of them, whether in person, by telephone or email. I suppose I know thats not possible, but I like to try. One member I tried to reach by telephone in October 2005, Victor J. Colaguori, W2VC, could not speak to me, his wife Virginia told me, because of the effects of Parkinsons disease, with which he had been diagnosed in 1993. By the time of my call, he was using a wheelchair and was unable to communicate. Victor joined RCA in 1974. He became a Fellow in 1976 and a life member in 2000. He worked for the U.S. Army Electronics Command in Fort Monmouth, New Jersey, from 1940 to 1974. Victor was a radio amateur, and when the Colaguoris moved from New Jersey to Palm Beach Gardens, Florida, Virginia brought all his radio equipment in hopes that he would resume his interest in it. She told me he stopped using the radio in 1994. According to an obituary placed in the Palm Beach Post on Feb. 23, 2007, Victor passed away peacefully on Wednesday, two days before, at his home, with his family by his side. He was born in Long Branch, New Jersey on Aug. 31, 1919 and resided in Oakhurst, New Jersey before moving to the Palm Beaches. Victor was an electronics engineer at the U.S. Army Signal Corps Research & Development Laboratory, Fort Monmouth, New Jersey. He was an avid radio amateur with the call letters W2VC. During World War II, as a civilian on special assignment, he went with the invasion forces across the English Channel setting up a radio relay system that kept General Dwight Eisenhower in direct communication with his battlefield commanders. For his achievement, Victor was awarded a Bronze Star. Victor is survived by his wife of 62 years, Virginia; daughters: Anne Gerde, Vickie Bender and Nancy Colaguori; two granddaughters; three great-grandchildren; three brothers: Anthony Colaguori, W2GUM; Albert Colaguori; and Francis Colaguori, all of Long Branch, New Jersey; and numerous nephews and nieces. Contributions in Victors memory may be made to Vitas Innovative Hospice Care, 1901 South Congress Avenue, Suite 420, Boynton Beach, FL 33426. In March 1944 the Signal Corps shipped several complete 100-mile ANA TRC-1, 3, and 4 systems, with spare parts and auxiliary operating components, to the United Kingdom. No one in the theater knew how to assemble or operate the sets. The 980th Signal Service Company, specially trained on antrac equipment in the United States, had not yet arrived in the ETO. In April the Signal Corps dispatched two of its civilian laboratory engineers as technical observers to introduce the equipment in the theater, help install it, and train operators for it. Observers was a misnomer. Amory H. Waite and Victor J. Colaguori, assigned to the Technical Liaison Division of the Chief Signal Officer, ETOUSA, at once went to work under Colonel Williams and his supply officer, Lt. Col. Elmer L. Littell. “Meanwhile, both the British and the American version of the new and tremendously significant innovation, multichannel radio relay, maintained heavy traffic loads. The equipment had been installed and put into operation much sooner than the cables. Moreover, it remained unaffected by the vagaries of the storms and hazards of the sea. “The American version of the equipment-the antracs-performed with spectacular success. Among the many persons who waited out the first anxious hours of the invasion were the two civilian engineers, Waite and Colaguori. Some days earlier, it had been determined that one of the civilians ‘would have the rather doubtful privilege of going into France on D-day or shortly thereafter. A coin was tossed, two out of three, and Mr. Colaguori won.’ As Colaguori prepared his equipment and truck and drove to the docks, officers and men of ETOUSA’s Technical Liaison Division helped Waite with the installation on the Isle of Wight, atop the hill called St. Catherine’s. On St. Catherine’s crest the British (and US Navy, using British AM sets) had already placed the several terminals of the British VHF radio links intended to reach the British GOLD and JUNO Beaches. “On the rounded grassy summit of St. Catherine’s stand the ruins of an ancient tower. A watchtower centuries old, it had witnessed signals before, for it had been used as a station for signaling the approach of enemy ships, including, on one renowned occasion, the Spanish Armada. More recently, the ruins had served as a landfall for the German air fleets. Now, as a final touch in this mixture of the hoary remote and fantastic new, the Signal Corps men installed the paraphernalia of the first antrac in Europe. “Fighting was heaviest at OMAHA. Colaguori, embarked on an LST with a unit of the engineers, could not get ashore throughout D-day. That night he succeeded, but it was many hours more before he could advance four hundred yards to the bluffs, where the fighting continued hotly. “Back on St. Catherine’s hill, the Signal Corps men waited and worried. For seventy-two anxious hours they had no word from any American unit. Then at last, fourteen minutes past one o’clock on the afternoon of 8 June, they saw the indicator rise on the receiver meter, adjusted their equipment, and heard with complete clarity: ‘Hello, B for Bobbie; this is V for Victor.’ Waite, as soon as he could answer, replied with strict propriety, according to SOP: ‘Hello, V for Victor; this is B for Bobbie.’ Then with less propriety, ‘Where in hell have you been?’ ‘What d’ya mean where have we been?’ expostulated Colaguori at OMAHA Beach, ‘We’ve been through hell,’ punctuated by the nearby explosion of a German 88 shell, which the listeners in England heard clearly. Exchange of messages then began. Late that afternoon the first facsimile transmission passed over the complete length of the 125-mile relay from Middle Wallop to OMAHA Beach. 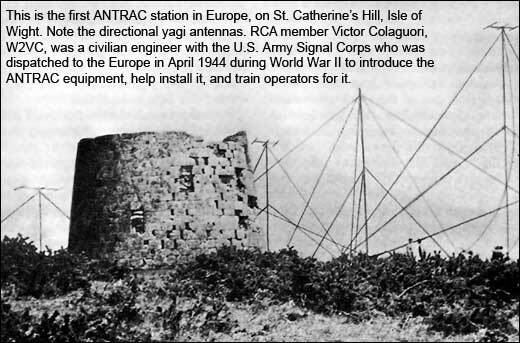 Three or four days later, the headquarters of the First US Army went ashore with carrier equipment, which immediately used the full potential of the antrac link as a channel carrier system. Scores and hundreds would follow as the demand for antracs reached a crescendo. You will be glad to know that Victor went with Colonel Williams at a very early date and that cross-channel communication was established on the AN/TRC-1 on D plus 2 at 1314 hours…. The circuit has been in continuous operation without fading except for two periods of not more than one minute each. The general opinion seems to be that this is the most reliable cross-channel circuit yet put into operation. This entry was posted on Sunday, April 8th, 2007 at 3:23 pm and is filed under Obituaries. You can follow any responses to this entry through the RSS 2.0 feed. You can leave a response, or trackback from your own site.